2pm-4pm at the Smyrna Community Center. Donations can also be made at the link above. love for you to be apart of this event to share your story! P.U.R.S.E. addresses the questions “What Are You Carrying?” Get rid of those heavy accessories you are carrying and exchange them in for lighter ones, such as JOY, PEACE & LOVE! Pack Light! 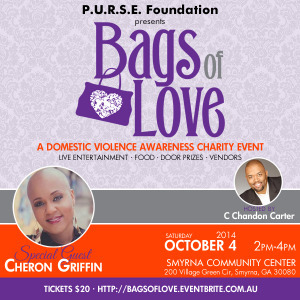 Proceeds from this event will assist P.U.R.S.E. Foundation in providing FREE “Teen Dating Workshops” for teens to learn about the signs/red flags of an abusive dating partner, what to do if they or someone they know is in an unhealthy relationship and provide positive coping methods through creative arts to release what they are carrying. The P.U.R.S.E. Foundation is a 501(c)(3) non-profit organization. Donations are tax-deductible to the extent allowed by law. Support the P.U.R.S.E. Foundation by making a purchase from Pink Zebra. Copyright © 2017 P.U.R.S.E. Foundation. All Rights Reserved. | Site Design by Suite369.com.